LONDON--(BUSINESS WIRE)--The latest market research report by Technavio on the global pest control services market predicts a CAGR of around 6% during the period 2018-2022. The report segments the global pest control services market by application (general pest control and termite control), by end-user (residential and commercial), and by geography (the Americas, EMEA, and APAC). It provides a detailed illustration of the major factors influencing the market, including drivers, opportunities, trends, and industry-specific challenges. The increase in insurance-based pest control services is one of the major factors driving the global pest control services market. Several players in the market are coming up with insurance-based pest control services due to the significant costs associated with pest control, particularly for commercial customers. Major hotels and other businesses are choosing these pest control services. 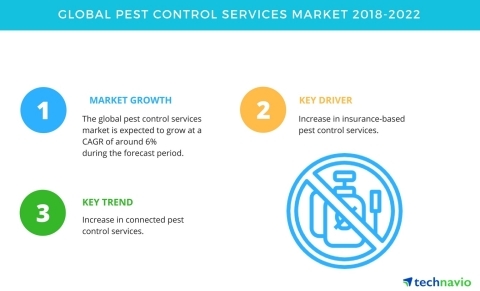 The increased availability of connected pest control services is trending in the market. RADAR is a device, which captures and kills mice humanely and hygienically. It is designed for industries with zero tolerance to pests such as the manufacturing, food industry, pharmaceutical, and healthcare facilities. The customer portal collects the data from the cloud storage system and provides reporting and analysis for businesses to monitor and analyze data for their sites in real time. More companies are expected to introduce connected pest control services during the forecast period. In 2017, the Americas accounted for approximately 51% of the market share, followed by EMEA and APAC respectively. Nearly 20,000 pest control companies operate in North America alone. Though the slow economic growth of the Americas in 2017, particularly in the US, had adversely affected the demand in a few end-user markets, the increased demand for pest control services from APAC countries has offset the effects of the slowdown in the Americas. The pest control services market in the UK is growing at a rate of approximately 6% annually. The increased international travel has promoted the spread of pests such as bed bugs, whereas climate changes have led to the spread of insects such as the oak processionary moth that can cause serious health issues and severe damage to the oak trees. Mark the beginning of spring with Technavio. Get 30% discount on all energy reports. Offer valid from 12th March for a limited period. Get 20% off on all media and entertainment services reports. Offer valid only till the 31st of March. The latest market research report by Technavio on the global pest control services market predicts a CAGR of around 6% during the period 2018-2022.